Crush 9 of the cookies to fine crumbs in food processor; reserve for later use. Cookies can also be finely crushed in a resealable plastic bag using a rolling pin. Crush the remaining cookies to fine crumbs; place in medium bowl. Add creamcheese; mix until well blended. Roll cookie mixture into 42 balls, about 1-inch in diameter. 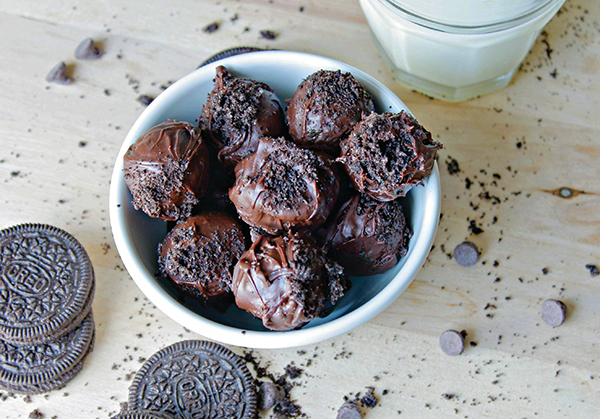 Arrange balls on wax paper-covered baking sheet and evenly pour melted chocolate over each ball. (Any leftover chocolate can be stored at room temperature for another use.) Sprinkle with reserved cookie crumbs.